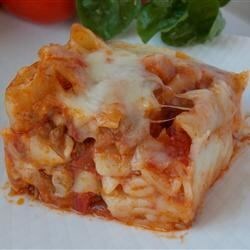 "Great ziti dish for any lover of pasta. Easy to make and 'wows' the crowd." Bring a large pot of lightly salted water to a boil. Cook ziti in boiling water until cooked through but firm to the bite, about 13 minutes; drain. Rinse ziti with cold water until cool; drain. Mix ziti, ricotta cheese, 1 1/2 cups tomato sauce, mozzarella cheese, egg, salt, and pepper in a large bowl. Spread 1/2 cup tomato sauce into the bottom of a 2 1/2-quart shallow baking dish. Pour ziti mixture into the dish. Top with remaining 1 1/2 cup tomato sauce and Parmesan cheese. Bake in preheated oven until sauce and cheese layer is bubbly and lightly browned, about 30 minutes. Let cool 10 minutes before serving. It's the simple solution to the weeknight dinner challenge. This is great recipe! Easy and delicious. My 3 year old loved it and he's generally a pretty picky eater so it made me very happy to see I'm enjoying it so much and asking for seconds! Delicious! I did not have ricotta so i just substituted with parmesan and sour cream. I will definitely be making it again!